Percutaneous transarterial renal hypothermia offers another option of for achieving laparoscopic renal hypothermia. A variety of studies in literature report on the efficacy of this technique. Marberger and Eisenberger (6) in the early 1970s, initially reported that renal artery perfusion cools the kidney three times as rapidly as does surface cooling. They also reported that surface cooling leads to heterogeneous cooling of the kidney, although this has now been shown to be erroneous and that uniform cooling is possible with surface hypothermia with ice slush. They reported on 63 patients who underwent hypothermic nephrolithotomy for extensive stone disease. Percutaneous renal artery access was achieved with a catheter. The renal artery was occluded with either a tourniquet or with a double lumen balloon tipped catheter in the artery. The kidneys were perfused with Ringer lactate or 5% Dextrane solution at 4°C. Rectal temperature was measured simultaneously. A control group of 39 kidneys undergoing the same procedure were cooled with surface ice slush. The average cold ischemia was 61.3 minutes in the arterial catheter group and 59.8 minutes in the ice slush group. Renal parenchymal temperature was not measured during the procedure. Follow-up consisted of obtaining hippuran clearance. They showed a statistically significant decrease in postoperative renal clearance in the surface cooled kidneys compared to the arterially perfused kidneys. They also reported that poorly functioning kidneys recovered better from the ischemic insult if the hypothermia was arterial as compared to surface cooling. More recently, Munver et al. (7) reported on a novel technique involving cannula-tion of the renal artery and infusion of cold lactated ringer's solution in nine patients undergoing open partial nephrectomy. Following occlusion of the renal artery and vein with vascular clamps, the vessels were cannulated with 14 gauge angiographic catheters. The ice cold perfusate was then run through the arterial catheter and the effluent cleared through the venous catheter. This led to a rapid (one to two minutes) drop in renal temperature that was uniform throughout the kidney. There were no complications reported in this series. Serial postoperative isotope scans revealed good function in the renal remnants. Janetschek et al. have reported on their technique of renal artery perfusion for laparoscopic partial nephrectomy. A total of 15 patients underwent laparoscopic partial nephrectomy under cold ischemia induced by renal arterial perfusion. The mean tumor size was 2.7 cm (range 1.5-4). Four of the tumors were completely intra-renal. An open tipped ureteral catheter was placed in the renal pelvis under fluoroscopic guidance. An angiocatheter was then passed into the main renal artery through a femoral puncture in the operating room by a radiologist. The kidney was approached laparo-scopically. The renal artery can be occluded either with the intra-arterial balloon or by arterial occlusion with a vascular clamp or a tourniquet. In the above series, the intraarterial balloon was used in two patients and the tourniquet in 13 patients. 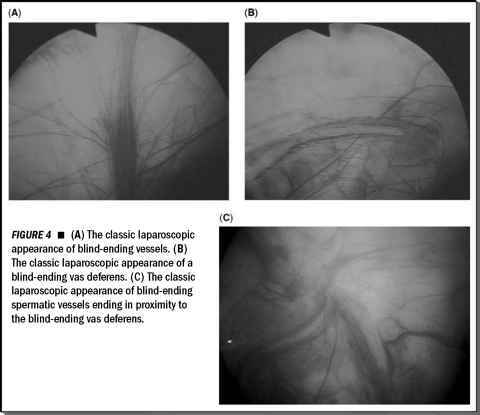 The balloon was unable to occlude the entire lumen that led to bleeding during resection. Intravenous mannitol was administered 15 minutes before arterial occlusion. Hypothermia was achieved by occluding the renal artery and infusing 1000 mL of iced Ringer lactate at 4°C at a rate of 50 mL per minute. Surgery was started immediately following the infusion. Renal temperature was monitored with a thermocouple probe in the parenchyma. When parenchymal temperature of 25°C was attained, perfusion was decreased to maintain steady temperature. Patient was warmed with a warm air blanket and rectal temperature continuously monitored. The mean time for renal parenchymal temperature to reach 25°C was 10 minutes following initiation of perfusion. Mean operative time was 185 minutes (range, 135-220). The angiocatheter placement required a mean of 16 minutes (range, 10-20). Mean total ischemia time was 40 minutes (range, 27-101). Mean amount of perfusate was 1580 mL (range, 1150-2800). Mean decrease in body temperature was 0.64°C (0.5-1.1). Inadequate occlusion of the artery by the balloon in the initial two patients led to significant blood loss, following which the authors modified their technique to include hilar clamping. One patient required a second look laparoscopy for persistent hemorrhagic drainage from the drain. The cause was found to be a parenchymal suture that had cut through. Hemostasis was achieved with strips of Tachocombb. Of the 15 patients, postoperative renal function was evaluated in eight patients, which revealed decrease of function on isotope scans proportionate to the parenchyma excised. Although an attractive option, this technique has the potential for injury to the femoral artery as well as the renal artery. This can range from an intimal tear to complete avulsion of the artery. Also this requires an additional procedure with the presence of a radiologist. Thus significant experience with renal artery catheterization is mandatory before this can be attempted.